Savor 100 Instant Pot favorites that punch up flavor without packing on pounds in Taste of Home Skinny Instant Pot Cookbook. Today’s home cooks turn to their Instant Pots for comforting meals and beat-the-clock convenience…and now they’re using these popular appliances to eat healthy, too! It’s true—you can serve up the hearty favorites you crave quickly and easily—and without an ounce of guilt. 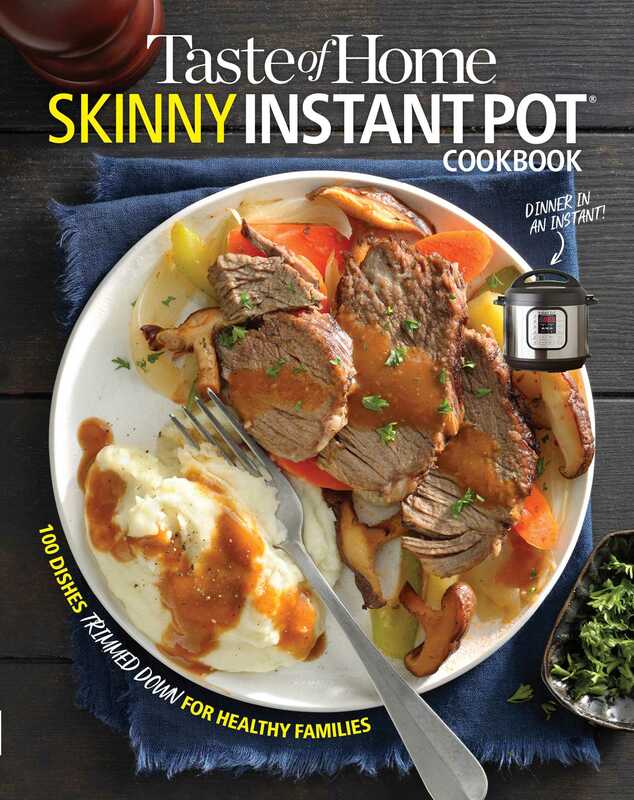 Taste of Home Skinny Instant Pot Cookbook makes it a snap to enjoy stick-to-your-ribs mainstays that are lower in calories, fat, sodium and/or carbs. Dish out a mouthwatering assortment of 100 appetizers, entrees, sides and more—all made easy in the Instant Pot, all full of flavor and all on the light side of the scale. You’ll even find 75 bonus recipes that round out Instant Pot entrees. These heart-healthy salads and breads help you keep commitments to eating right. In fact. every recipe in this sensational collection offers a complete sets of nutrition facts so you can quickly calculate weight-loss points, count calories or watch your sodium intake no matter what’s on your menu. With Taste of Home Skinny Instant Pot Cookbook, it’s never been faster, easier or more delicious to eat right!